Pineville, Ky. (April 11, 2019) On April 10th, 2019 at approximately 8:27 p.m. Kentucky State Police, Post 10 Harlan was contacted by the Bell County Sheriff’s Office in reference to a homeowner locating a human skull in their back yard. Troopers from Post 10 responded to 1599 Harbell road in the Pineville community of Bell County along with the Bell County Coroner’s Office. The Bell County Coroner has taken possession of the skull and transported it to the State Medical Examiner’s Office in Frankfort on April 11th for forensic testing. KSP has currently opened a death investigation but have no new information at this time into an identity of cause of death. As KSP receives more information, it will be released. Case is under investigation by Detective Aaron Frederick. 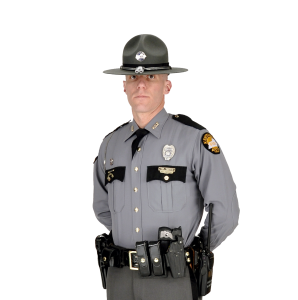 On April 11, 2019 at approximately 2:00 p.m. Kentucky State Police located and charged both individuals who were in the Black Hyundai when it stuck Mr. Fuson. Tpr. Don Perry was patrolling US 119 this morning when he saw a vehicle matching the description of the vehicle involved in the collision. Tpr. Perry conducted a traffic stop in the Page community of Bell County which led Detectives to charging both inside of the vehicle. The operator of the 2002 Hyundai Elantra, Joshua D. Lewis (34) of Monticello Ky and his 15 year old son were traveling from Monticello to Harlan when the collision occurred. Mr. Lewis is charged with leaving the scene of an accident-failure to render aid with death or serious physical injury and lodged into the Bell County Detention Center. The 15 year old son is charged with tampering with physical evidence and placed into a juvenile detention center. More charges are pending at this time. Collision is under investigation by Det. Josh Howard.